The information that we take in and the information that we send out must go through our Frame of Reference, and it’s important to know how this Frame affects our view of the world. I picture everyone peering out at the world through their Frames of Reference. 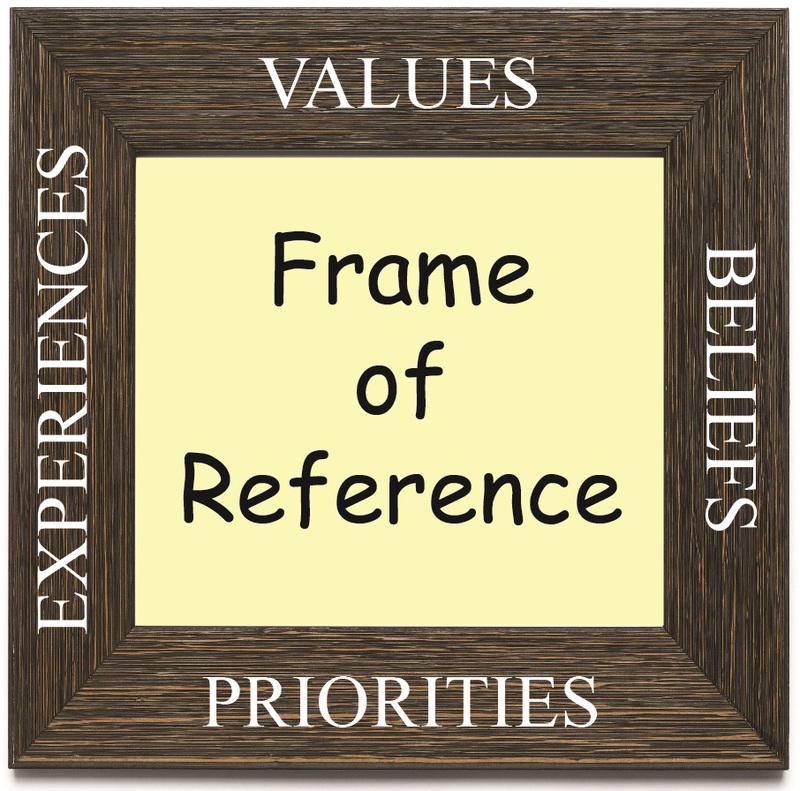 Our Frame of Reference is made up of four parts: values, priorities, experiences, and beliefs. Let’s begin with values. Picture your own memorial service in your head. You’ve led a full and meaningful life with which you are satisfied. What three things are you sure that people will say about you? The list that you come up with is your values. For the most part, our values stay the same throughout our lives. Priorities are the second part of our Frame of Reference. Priorities are a snapshot of what is important to us right now. Putting a priority at the bottom of the list doesn’t mean that it’s not important to you at all; it’s just not something you focus on right now. Priorities include things like family, career, faith, and health. The third part of our Frame of Reference is experience. What we experience in our lives has a profound effect on how we view the world and experience life in the future. Over time, our experiences create our beliefs about ourselves and life in general. Beliefs are the final part of our Frame of Reference. Many of them are the foundations of our lives – personal rules that we don’t realize exist. As adults, we get to examine our beliefs and decide if they are serving us well or not. We can get rid of a lot of stress if we realize that the values, priorities, experiences, and beliefs of others are not identical to our own. Every person has a unique Frame of Reference that leads them to see things differently and make different decisions than the ones that we might make. We can accept that and know that different is not necessarily wrong – which makes life easier for everyone. Our Frame of Reference creates the world in which we live. Intentionally examining and creating our Frame of Reference can make all the difference in the life that we experience. Usually, an initial discovery session with a coach will include an examination of your values, priorities, and beliefs, as well as the significant experiences that have influenced you. It feels great to get rid of limiting beliefs that are holding us back.